On Sunday, the Bradford Bulldogs under 15’s travelled to Coventry with a longer bench of four lines, some of which were new additions to the team. What some would’ve thought to be a confident victory for the Bulldogs, soon became tough; Coventry gained an early first goal within the first five minutes of the first period. Jacob Lutwyche’s timely punctuality wasn’t just limited to arriving on time, but to taking actions at the right times, as he quickly led the Bulldogs to take back control and brought the game to 3-1 taking the upper hand. This forced pressure onto Coventry, who continues to show determination and scored seconds later. Bradford then speeded up the game and the puck was fired, bringing the first period score to 4-2. With neither teams scoring, the second period was an even affair with some great defence and saves from both teams. Although, Coventry showed some penalty trouble during this period. The final period saw Bradford take three more quick firing shots, securing the lead and made the score 7-2 to the Bulldogs. A goal from Coventry soon followed, but Bradford continued to take the lead, closing the game 10-3. This was a well deserved victory, allowing the Bulldogs to bring the points home. Most valuable player award went to Jacob Lutwyche, which was well deserved. the relentless Bulldog attack. MVP Daniel Justovics. 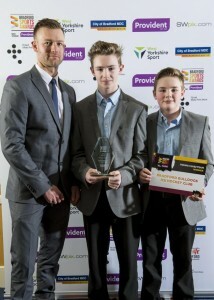 Congratulations to the the Bulldogs yet again on netting the Young Club/Team Award in this year’s Bradford Sports Awards hosted by the Telegraph and Argus. ‘Everyone works so hard at the Club, so to get an award and some recognition is fantastic!’ said head coach Andy Brown!